From refrigerators and stoves to microwaves, everyone knows the typical appliances and layout of a kitchen. However, a commercial kitchen is a whole different ballgame. Your food service business needs equipment that can handle the stress of constant, daily use. It's common knowledge that some foods need to stay cool, or even frozen. Your commercial kitchen will need both a refrigerator unit and a freezer. Depending on the size of your business, you will also need an ice machine that produces a large volume of ice. These units are made to suit restaurants or food service facilities because they are essential in the food handling operation. Be sure to choose your models based on your specific needs. For example, some large facilities require walk-in freezers while others only need storage space for standalone freezers. Whatever your business needs, there's surely an appliance that's right for the job. Of course, the food that's being refrigerated also needs to be cooked. That's where heating appliances come in. 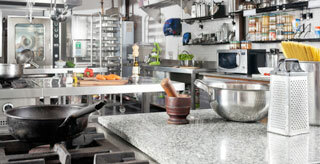 Your commercial kitchen will need proper kitchen ranges. These units can be either gas or electric but both offer a high-power system to cook a wide variety of foods. Most ranges come with an oven, which is also necessary in a kitchen setting for baking, toasting, roasting and much more. Some commercial kitchens also install a microwave oven to quickly heat up various foods, but it’s not a necessity. Cleaning is probably the least favorite task of most people, but it's one that needs the right kitchen appliances the most. Without a commercial dishwasher, your kitchen will not be able to clean everything efficiently. All of your machines, from ice machines and refrigerators to ovens, need cleaning. Make sure that you have the right cleaning solutions to take care of each and every mess. Generally speaking, dishwashers fall into four separate categories: undercounter dishwasher, glasswasher, door-type commercial dishwasher and conveyor type dishwasher. Some facilities have several. Be sure to examine the different types to determine which one is right for your business. Your food service business may not need everything on the list. Or, you may need other things that are not on the checklist. Examine your needs to get the right equipment for the task.